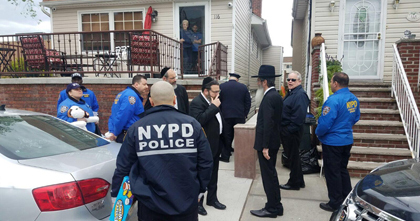 In an outpouring of support for the family of an eight year old Marine Park boy who was killed in a freak accident a week and a half ago, representatives of both the NYPD and Misaskim showed up at their home yesterday, loaded with gifts, as a gesture of good will. Kevin Reilly was playing outside on April 27th when his basketball landed in a ceramic planter attached to the exterior of the family's Ryder Street home. As the eight year old climbed the bars of a lower window to retrieve his ball, the heavy planter affixed to a higher window came loose and fell on top of him, crushing him and pinning him to the ground. Kevin was rushed to Coney Island Hospital where he was pronounced dead a short time later. Kevin's tragic death had resonated throughout Brooklyn and beyond, and in response to helping the family cope with their devastating loss, several members of Misaskim and the NYPD's Community Affairs Bureau showed up at the family home on Monday with bags full of gifts for Kevin's mother and two sisters. Meyer was accompanied by Rabbi Dovid Goldwasser and Misaskim members Meir Weill and Shmiel Rosenbaum. The delegation also included the family's pastor, Reverend Thomas Doyle of the Good Shepherd Roman Catholic Church. Among the many members of the NYPD's Community Affairs Bureau who visited with the family was Detective Michael Roimao who credited Meyer for putting together the meeting. �He started the ball rolling and that is why we are all here�, said Roimao. The boy's divorced mother was overwhelmed by emotion at times during the Monday visit, tearfully thanking the group who showered her and her daughters with gift cards, fidget spinners, emoji pillows, plush toys, craft kits, a camera and a gift certificate to the American Girl doll store in Manhattan. Rabbi Goldwasser said that witnessing such an incredible outpouring of human kindness was an extremely moving experience for him. �It was such a privilege for me to be there,� said Rabbi Goldwasser.